Write to the Minister of Health instantly by clicking here! The so-called "Enviropig™" could soon be the first genetically modified (GM) (also called genetically engineered or GE) food animal on the market. Enviropig™ is the trademarked industry name for a pig that has been genetically engineered to excrete less phosphorous in its feces. Enviropig™ was developed by researchers at the University of Guelph in Ontario. Write to the Minister of Health instantly by clicking here. Join the Campaign: Sign on here to participate, share your ideas and get the latest news. Circulate the action alert to your networks - feel free to add your own introduction but please do not edit the alert itself (this action will continue through the summer). Donate today to support the campaign. The goal of the GM Enviropig™ is to provide intensive livestock operations (factory farms) with a product to reduce the amount of polluting phosphorous they produce. Phosphorous from animal manure is a nutrient for plants that becomes a pollutant if there is too much of it for crops to absorb, and the excess runs off into streams and lakes. Researchers claim that the feces from Enviropig™ could contain 30 to 70.7% less phosphorus. Enviropig™ is designed to reduce the amount of phosphorous coming from the pigs themselves, so that factory farms do not have to pay for other measures such as reducing the number of pigs they raise in one place, changing feed ingredients, trucking liquid manure longer distances, dry composting manure, or expanding the area of land for spreading manure. Enviropig™ is genetically engineered to produce the enzyme phytase in its salivary glands to enable more effective digestion of phytate, the from of phosphorus found in pig feed ingredients like corn and soybeans. Scientists inserted a transgene sequence that includes an E-coli bacteria phytase gene and a mouse promoter gene sequence. In February 2010, Environment Canada granted approval to the University of Guelph for the reproduction and exportation of Enviropig™. 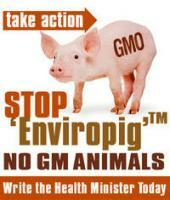 Health Canada could approve Enviropig™ for human consumption at any time. Who "Created" and Owns Enviropig™?